"Exceptional. In an original and compelling story set in a small village long ago, a little boy is born, and to his adoring parents' dismay, makes not happy baby noises, but crabby and startling ones. No medical cause can be discerned: ‘He just wants what he wants when he wants it!' the doctors all say. We follow the boy through childhood, where his attitude only worsens. Passages such as this one will cause parents of even the most well-behaved children to nod in recognition: ‘He shouted when other people were talking. He howled and howled when he had to go to bed. And no matter what they were having for meals, he fussed about it.' Scolding does no good. In the midst of ‘muttering a complainy grumble,' the boy meets a small man in a green hat and elf-like outfit who silently snatches him into a dark forest and gives him a job—he is to be the Keeper of Ugly Sounds. The boy must sort the cries, sighs, and groans into bags, and in the process he realizes just how ugly those sounds can be. Dramatic and lush illustrations meld perfectly with the text and do much to deepen the story. This is a lesson-based tale, but both the text and illustrations go about their business gently. An engaging and beautiful book. Highly recommended." "From the first sentence, I was captivated by Eleanor Walsh Meyer's new book, The Keeper of Ugly Sounds. Delightfully written, it will appeal to children of all ages and to the parents who will read it to them, too. Children's stories tend to be uninhibited and original. This is one of the most original I have read in many years. And the big, colorful illustrations by Vlad Guzner go with it perfectly. I can imagine that little readers will spend much time trying to help the small hero, or maybe I should say the villain, find the proper holes in the center spread to hold his ugly words, such as eek, yuck, brrr, hiss, and so on." 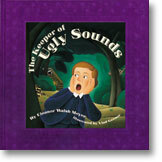 "[A] boy who made lots of negative noises was made to become the Keeper of the Ugly Sounds. Students thought this was an excellent story. Excellent!"